Valentine’s Day is coming up. Want to break out of the candy and roses rut? Check out Rainbow for a ton of great gift ideas for your sweetie. There’s jackets, vests and sweatshirts. Montana Silversmith Jewelry and belt buckles. Boots for everyone – Western, Fashion, waterproof. Accessories such as purses, scarves, socks and beanie caps. How about some fancy tack, a new bit, or a colorful halter and rope? Bright pink bell boots? Guys deserve a treat on Valentine’s Day too! Dress ’em up in a new pair of Wrangler jeans! Rainbow has the best price anywhere on Cowboy Cut 13mwz denim jeans! Or a real treat … something from the Outdoor Power Equipment department. So surprise your sweetheart with something original for Valentine’s Day – February 14th! It’s been a dark and stormy winter, but spring is coming … Really! One of the first signs of spring at Rainbow is the arrival of chicks. Just listen for that cheerful cheeping, and be ready to join in the fun at the Poultry Party on February 18th. All chicks will be $2.99 each! There will be seminars about building your back yard flock at Ukiah at 10 am and Lakeport at 1 pm. All poultry feed and supplies will be on sale at 10% off. Plus, join in the fun with the in-store EGG TOSS at 11am in Ukiah and 2pm in Lakeport. Winner will receive a $50 Rainbow Gift Card! Chickens make fun pets, who reward us with fresh eggs! 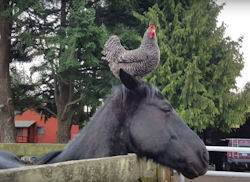 And, chickens have a long tradition of being companion animals for horses. Check out some of the advantages (and a few disadvantages) of have stable chickens, in this article from the Pro Equine Grooms community. Jillian Kreinbring Equine Biomechanics Course: Understand your Horse’s Movement to Realize His Potential. April 7, 8 & 9 at Highland Springs Equestrian Center, Kelseyville. The 2 ½ day lecture series explains healthy movement in depth and gives learners the opportunity to develop their eye so they can see healthy and unhealthy postures. Get the complete details here, including registration information. This month we have two great coupons for you! Save 20% on any winter horse blanket in stock! There is still plenty of cold, wet weather ahead – bundle up your pony in a new warm blanket! Then, treat yourself and your horse with 20% off any leather tack! 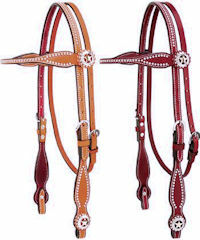 Head stalls, breast collars, reins and more! 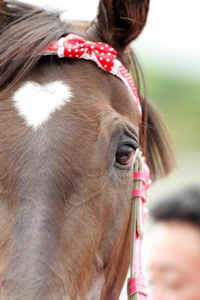 A pretty new headstall would make a great Valentine’s Gift (hint, hint). Enter to win a $15.00 Rainbow Gift Card! All correct Trivia answers are entered into a random drawing for a Rainbow Gift Card. Last month’s winner is Sadie Giordanengo, and the correct answer was the Willits Junior Horsemen donated $500.00 to SAFER. This month’s question – When was the Clear Lake Junior Horsemen club founded? This entry was posted on Tuesday, January 31st, 2017 at 3:05 pm	and is filed under News, On The Right Lead Newsletter. You can follow any responses to this entry through the RSS 2.0 feed. Both comments and pings are currently closed.